T hat evening in Istanbul I think I have gotten on the wrong flight. The plane where I find myself cannot be heading for Iraq. On board are women of regal beauty and elegance, children in multicolored outfits, luxuriously beribboned gifts, a contagious and light air of celebration. But no, I am on the right flight. It is the eve of Novruz, the Persian New Year, and I am witnessing the surreal return home of Kurdish migrants from Bosphorus City. At night the breath of newborns rocks our airplane en route to war. Today, like twenty years ago in the Balkans, everything in the Middle East celebrates the intimate proximity between normality and horror. 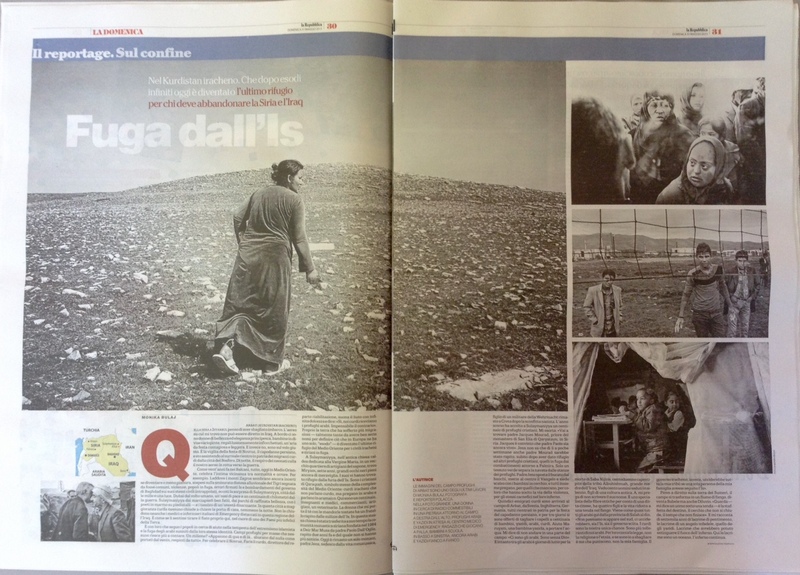 Where the Zagros mountains, for example, seem still uncertain about whether or not to become a plain, still suspended over the boundless alluvial expanse of the Tigris, marked by common graves, violence, people in flight, horrors bearing the signature of Daesh and bombings carried out by the Baghdad government against its own trapped civilians. Here lies the surprise of Sulaymaniyah, city of a thousand and one lights, a Dubai with a human face, an oasis of peace, a mere hundred kilometers from the conflict. Sulaymaniyah, with well-built sidewalks, parks of refined Persian beauty, poets in marble on pedestals and taxi drivers of disarming honesty. In this Kurdish-majority city no one locks their doors, not even at night, not even the Italian doctors and nurses working for Emergency, who remain behind in this Iraqi region. You feel as if you were catching your breath right here, in the heart of one of the most unfortunate countries on Earth. After the siege of Misurata in Libya, after the Ebola nightmare in Sierra Leone and the barbed wire in Kabul, even an Iraqi city can become an oasis. It is with them that I follow the tortured people seeking help amidst the storm of Islamist extremism and the flight of the Sunni Arabs, escaping their own identity, in the refugee camps where Emergency constructs and manages efficient and extremely modern medical centers for countless masses of humanity. They tell me “They appear here and there… they pop out of nowhere, as if they have been brought in by the wind, and they are rejected by everyone.” Hawar, who directs the first Emergency hospital for the victims of mines (some of them set by Italians at the time of the Iraq-Iran war), cooks lamb skewers for forty people, while Elisa, whose cheerfulness is contagious, laughs even in her dreams. And there is Luigi, a refined, sweet nurse, and Marina, who, when it is 45 C degrees in the shade, in Lashkargah, celebrates Ramadan together with the Afghan patients, just to understand. And then Giuseppe, a world-traveler who is an expert at overseeing sanitary systems under pressure and in preparing garlic soup, or Marcello, who, like an alchemist, travels the world to transform rivers into drinkable water for thousands of displaced persons. 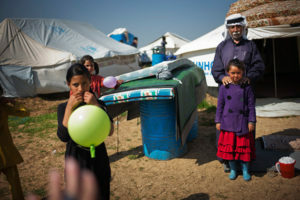 The paradoxes of the Kurdish world: it is precisely this land that has suffered more migrations—so many they have seven different words for “exodus,” known in Europe by a single term—that has become the final refuge in the Middle East for Iraqi civilians and fleeing Syrians. And who knows if this quality, barely mentioned, will turn into a chance for survival for one of the peoples who have suffered the infinite storm of Arab wars. Still in Sulaymaniyah, in the ancient Chaldean church dedicated to the Virgin Mary, in an old neighborhood populated by soap-makers, I find Maryam, age seven, with large black eyes still full of wonder. Her family has found shelter here from the fury of Daesh extremists. 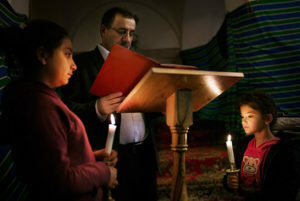 They are members of the Christian Qaraqosh community, a true symbol of the complexity of the Middle East: Iraqi Kurds who do not speak Kurdish, but pray in Arabic and speak Aramaic. There are a hundred or so of them here, teachers and doctors, professionals, businessmen, craftsmen and even a veterinarian. The woman who brings me tea with toasted almonds has a brother who was kidnapped by Daesh militias. It is to this very church that the Syrian monastic community, founded in 1984 in Deir Mar Musa by Father Paolo Dall’Oglio, was moved. Today only a single monk remains, Father Jens, a German whose life is worthy of a novel; he is the son of a Wehrmacht soldier who remained in Crete after the Nazi defeat. After wandering at length around the island and spending three months with the Bedouins in the desert, Jens arrived at the monastery of Mar Musa, which he nostalgically describes as “almost a trap of beauty.” And he adds: “From then on I always felt that I was in the right place at the right time.” But it is as if he were saying: look at what we have lost. Last year Father Jens welcomed to Sulaymaniyah a hundred or so Christian refugees. Meeting me, he exhorts: “Go find Father Jacques Mourad, prior of the monastery of San Elia di Qaryatayn in Syria. Jacques believes that father Paolo is alive.” Jens doesn’t know that within a few weeks Father Jacques Mourad will also be kidnapped, immediately after he, in turn, gave shelter to other Christian refugees fleeing the bombings around Palmyra. He doesn’t know that after four months, Father Jacques not only will survive daily requests to stay his death sentence, but will also escape, fleeing on a motorcycle, with the help of a Muslim friend, and later saving other kidnapped victims. I help Maryam, a Yazidi girl, carry water. She tells me not to go into one part of the camp: “The Arabs live their. They are Godless.” And meanwhile among the Arabs it is the day of mourning for the death of Saba Nijiris, the one hundred two-year old ancestor of the Albuhishmah tribe, the great mother of Iraq. I see a hundred men seated in silence, sons of an ancient culture that celebrates respect for the elderly, coming together, personal relationships. A. begs me to not write his name. He is a specialist in fiber optics, working for a Chinese company, he has four children and has been reduced to living in a tent in the mud. Like almost all the Arabs here, he comes from the province of Salah al din. “We cannot escape to the south, they would kill us, both the Daesh and the Shiite government. The Kurds are our only chance. They are more tolerant than we Arabs. For them it is the law that matters, not religion or ethnicity, and if I make a mistake, they punish me, not my family. The Iraqi government would kill my entire tribe if a single person in my family had followed Daesh.” A nurse contradicts him: “The Islamic State has come to free the city, to live in peace, and has never attacked civilians.” But for the United Nations the situation is desperate, civilians with women and children are caught in the crossfire and reduced to eating tree bark. A million refugees have to be relocated. I walk over the land of the Sumerians, and meanwhile a driving rain transforms the camp into a river of mud, it becomes Babel after the collapse but also the Flood. 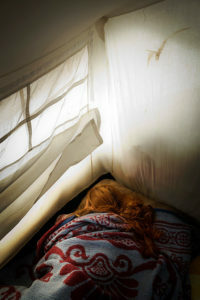 “Look”—a man beneath a tent says to me—“it is the relay race of destiny, the circle that doesn’t close, time that doesn’t end.” And he speaks to me of seven thousand years of tears of regret, the tears of an unfaithful angel, the angel of the Yazidi. Tears that might have extinguished the hell fires. Here there is an ocean of tears, but hell persists.